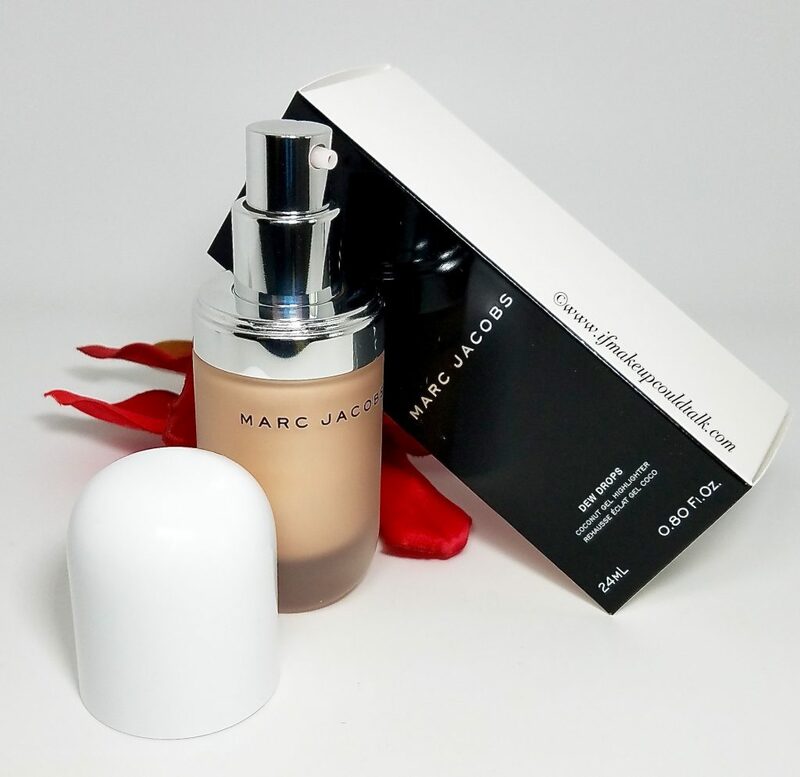 Home Marc Jacobs Beauty Marc Jacobs Dew You Dew Drops Coconut Gel Highlighter review. Marc Jacobs Dew You Dew Drops Coconut Gel Highlighter review. 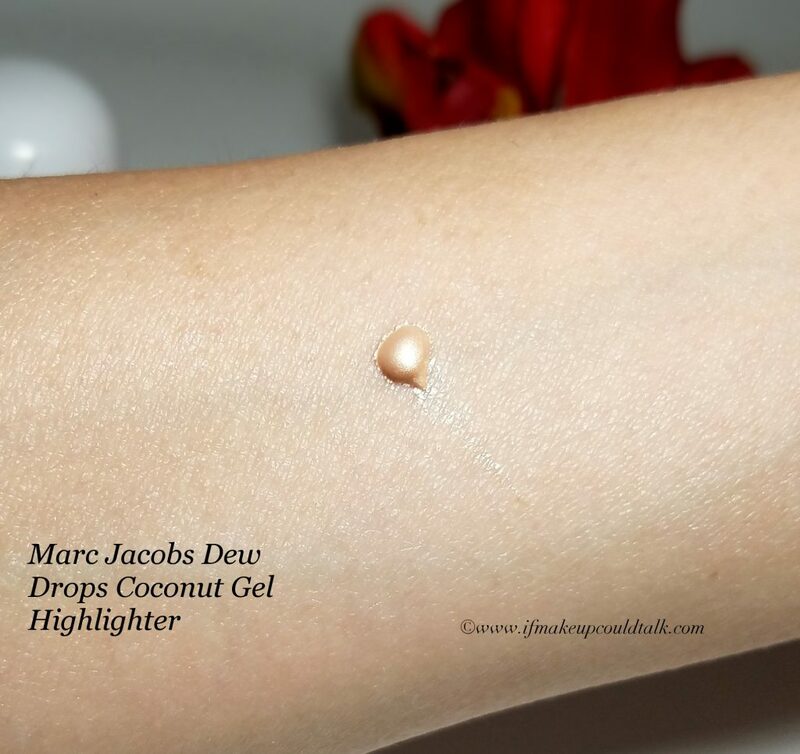 During the recent Sephora VIB Rouge sale, I had a moment of weakness and purchased the new Marc Jacobs Dew Drops Coconut Gel Highlighter in Dew You ($44 USD/ .80 fl.oz.). As I have stated in my previous post, I am making a conservative effort to cut down on cosmetic purchases, however in my pathetic defense, this gorgeous golden liquid illuminator seemed too perfect to pass up. After much trial and error, I have come to a firm conclusion–I should have stuck to my limited no-buy. Marc Jacobs Dew You, you are indeed beautiful, but gosh darn-it, I’m just not that into you. I hope you enjoy. The packaging for this illuminator is truly spectacular. The pump can be easily controlled to dispense the tiniest drop of liquid or a full pump, depending on how much pressure is applied. The liquid formula easily flows without clogging or dry bits accumulating around the opening. The thick frosted glass container is certainly luxe and weighty. Personally, a glass container is one of the factors that always inspires a purchase. For the price, it is nice to see glass utilize instead of lesser quality plastic. The typical concern of glass not being travel friendly is not applicable in this case, the substantial glass would be quite difficult to shatter. 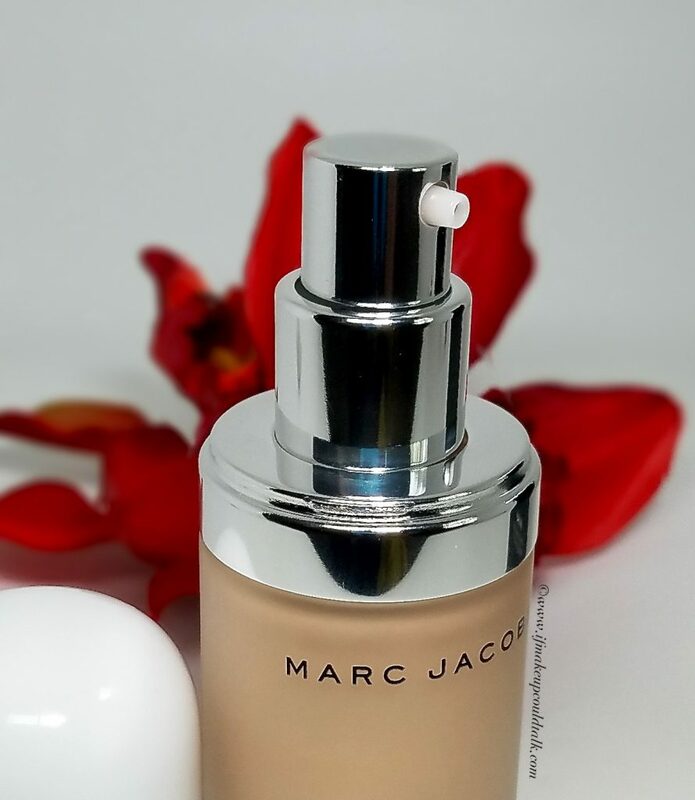 Similarly, the Re(marc)ble foundation is housed in an equality sturdy glass container, but the inefficient and wasteful applicator has put me off from investing in another bottle. If they implemented this fantastic pump on that foundation, I would order my usual shade in a heartbeat. As briefly implied, the formula of Dew You is ridiculously silky smooth. The initial cooling sensation is refreshing, but quickly dissipates within seconds. The substantial gel consistency sheers out with fingers or with a sponge (my preferred tool). When used sheerly, the formula dries down and sets very quickly. This could be a good or bad thing depending on what you prefer in a liquid highlighter. On my dry skin, the limited malleability resulted in product sitting on top of skin rather than blending in with the rest of the makeup. More often than not, I found myself having to go back and lightly buff bronzer over the edges of the highlighter to incorporate the colors. Its also worth mentioning, due to the fast setting time, trying to correct any mishap can disturb foundation. The concentrated pigment does not require a lot of product for high impact result. The small amount above was all that was needed for both swatches, with some to spare. My advice for a more “natural” look is to use thin layers, allowing a few second to dry in between layers. Dew You works brilliantly as a base for any powder highlighter, the gel formula really encapsulates any powder and keeps it in place all day. Oiler skins would really do well utilizing this method to ensure their highlighter stays in place all day. On my complexion, the yellowish golden tinge clashed with my olive undertone. I found mixing a bit of Nars Laguna Liquid Bronzer (reviewed here) created a deeper, more flattering shade. In addition, I cannot help but think, a pinky/peach duo chrome shift would have made this product more appealing. As it stands, I can achieve the same effect with any powder formula, simply by dampening my brush. Many young ladies who have reviewed this on YT, utilize this illuminating gel mixed into their foundation for a luminous effect. Although in theory this method would work for dry skins, in my experience, the illuminating aspect accentuated every fine line on my face. Furthermore, in the presence of sunlight (not those ring lights every YouTuber uses to defuse reality), my foundation had a slight glistening quality. The appearance of a healthy glow on targeted areas is quite flattering, but when the entire face is illuminated, the outcome is a bit overdone. Ironically, if I recall correctly, a few years ago Revlon underwent serious criticism for formulating their PhotoFinish foundation, with the same illuminating properties these YT beauties are trying to mimic. 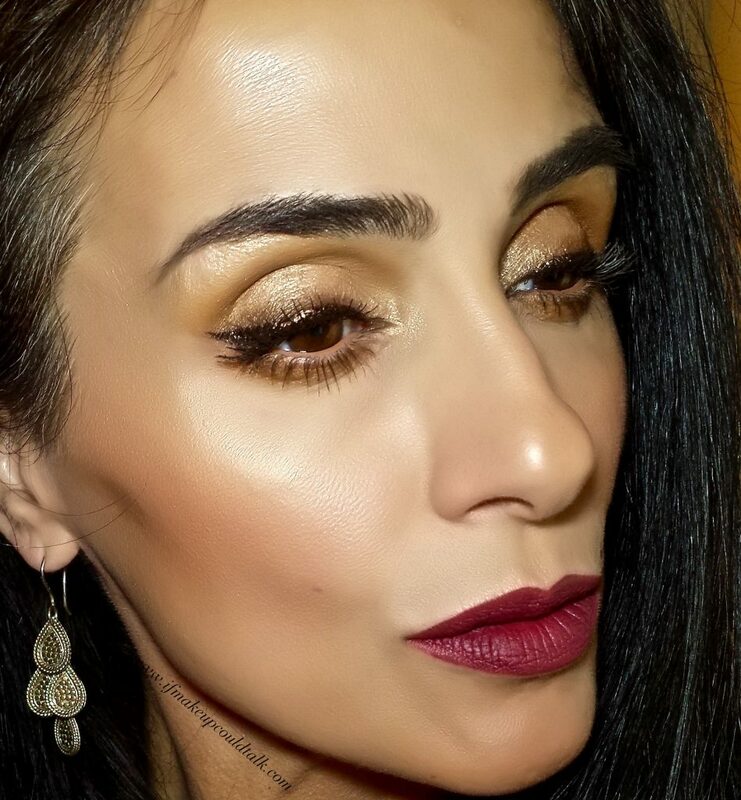 Wearing Marc Jacobs Dew You Dew Drops Coconut Gel Highlighter. For the above look, Marc Jacobs Dew You Dew Drops Coconut Gel Highlighter was applied to the mobile lids, inner corners, brow bone, bridge of the nose, upper lip and cheekbones. Admittedly, the formula works really well as an eyeshadow over a primer. My lids glistened the whole day without any issues. Although the look was seemingly put together, I was not fully comfortable sporting this amount of illumination all at once. The overwhelming feeling that every little pore and wrinkle was emphasized, resulted in my lack of interest in Dew You. Makeup used for the rest of the look is as follows: Estee Lauder Double Wear Foundation in Fresco 2C3 (here), Vincent Longo Cooperkiss bronzer and Sandalwood blush (here), YSL Souffle d’eclat loose powder in shade 3, Bobbi Brown Golden Bronze Liquid Liner (here–must have), Bobbi Brown Camel eyeshadow in the crease and lower lash line (here), Giorgio Armani Eye and Brow Maestro in 2 Wengewood (here), Colourpop Lippie Pencil in Lady with Giorgio Armani Lip Magnet in 600 (here). Josie Maran, Illamasqua, Marc Jacobs and Edward Bess. 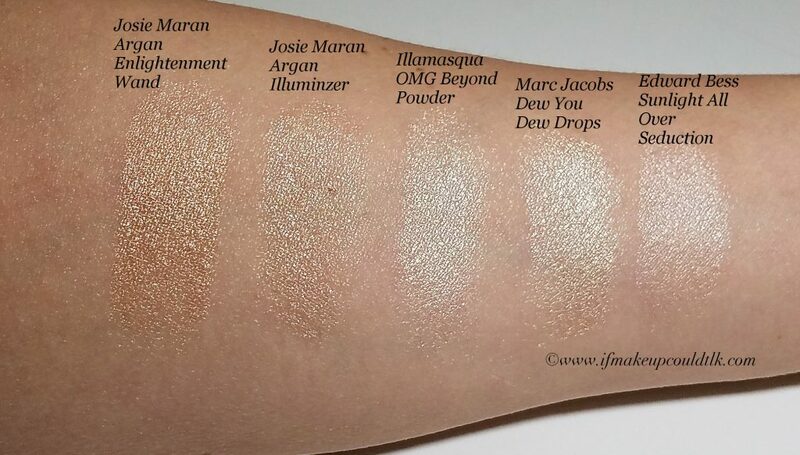 Josie Maran Wand and Liquid Illuminator (reviewed here) both have an obvious bronze tone in comparison to the others. The deeper golden coloring suits my complexion more so than a Dew You’s bright golden hue. Personally, the wand’s creamy consistency is my favorite as it glides on the skin easily and melds with the skin seamlessly. Illamasqua OMG Beyond Powder is my love (reviewed here) . The slight pink/gold shift is so flattering and the formula is ultra creamy. This is my go-to everyday powder highlighter that never lets me down. Edward Bess Sunlight is a long time favorite. The champagne color has a pink undertone that works best on light/medium complexions. This is one highlighter that exudes that much sought after, sophisticated lit-from-within glow. Although outrageously priced, I still contend the cream to powder formula is the very best highlighter, especially for maturing skins. 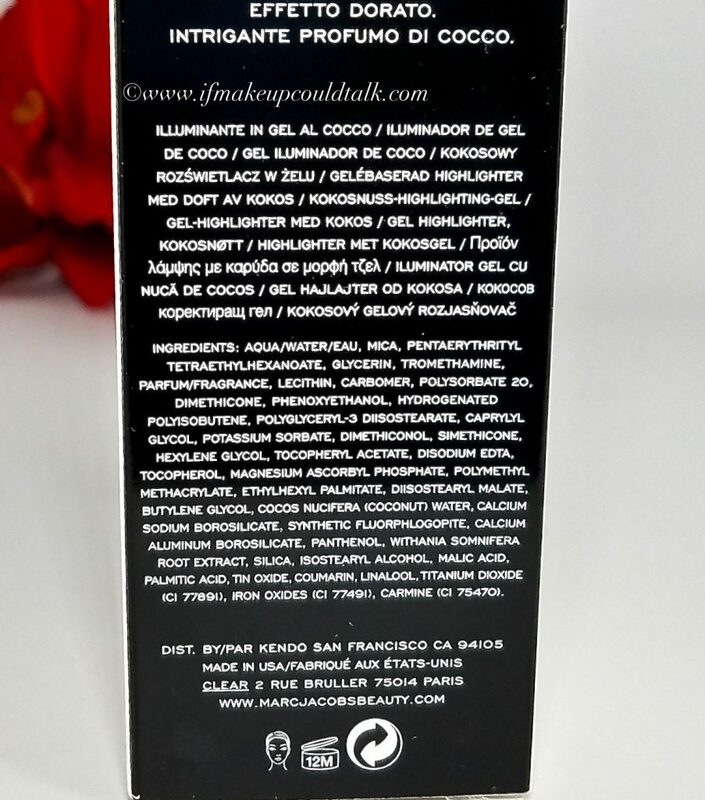 Marc Jacobs Dew You Dew Drops Coconut Gel Highlighter ingredient list. Although parabens, sulfates and phthalates are omitted, the seemingly natural ingredients emphasis is far-fetched. The hand full of natural components are lost in a 95% sea of chemicals. Granted, I am not a stranger to chemicals in my cosmetics, but the marketing for this product really grinds my gears. “It’s formulated with five forms of coconut and provitamin B5 to help hydrate and nourish skin” –research some/all of these ingredients and you be the judge. 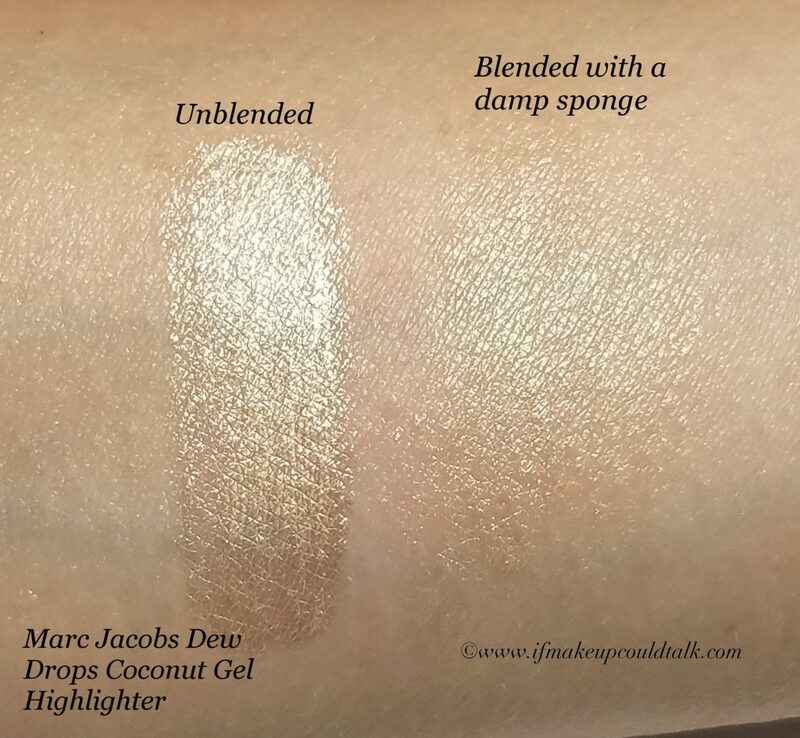 Makeup would tell you Marc Jacobs Dew You Dew Drops Coconut Gel Highlighter will appeal to many, just not to this blogger. The smooth consistency, golden coloring, quality packaging, longevity and delicate tropical fragrance provides the right amount of smoke and mirrors. Dew You reminds me of that “really great guy” everyone else loves; he’s gorgeous, smooth, suave, funny, has moments of brilliance, yet in private, he is a bit needy and has something to hide. Simply put, he just doesn’t do it for me. Sorry–I’m not sorry. Until next time, be well, stay safe and be happy. Great review. This sounds awful especially when mixed with foundation. Have you tried Burberry’s Fresh Glow Luminous Fluid Base? It’s a champagne pink & I’ve enjoyed the light luminous effect. There is a shimmer to it, but this one actually is fine enough to not cause any bad effects. My dislike for this product is purely from a more mature perspective. It’s that type of product that you look at and say, what is all the fuss about? It’s not all bad, just not for me. I have tried the Burberry Fresh Glow when it first came out (only one shade offered at the time) and found it was a nice product, but did not show up on my skin. I may need to look into the darker shade (Golden Radiance)–its more bronze. Thanks for the reminder and for your support.